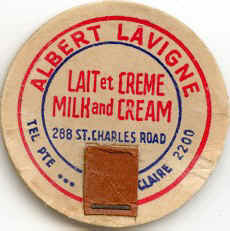 Mr. Albert Lavigne died several years ago. He had three sons, Rosaire, Lionel and the youngest one was Gaétan. Rosaire and Gaétan still living but Lionel passed away. Rosaire said that he had a few bottles but one day he was burglered and all the bottles were stolen. 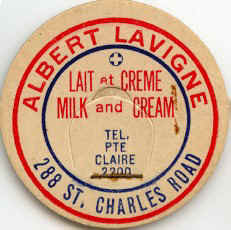 He said that the dairy started in 1939 and was situated 288, St-Charles Rd in Pte-Claire. Today, this sector is called Kirkland.